The Battle of Spotsylvania Court House, sometimes simply referred to as the Battle of Spotsylvania, was the second major battle in Lt. Gen. Ulysses S. Grant's 1864 Overland Campaign of the American Civil War. 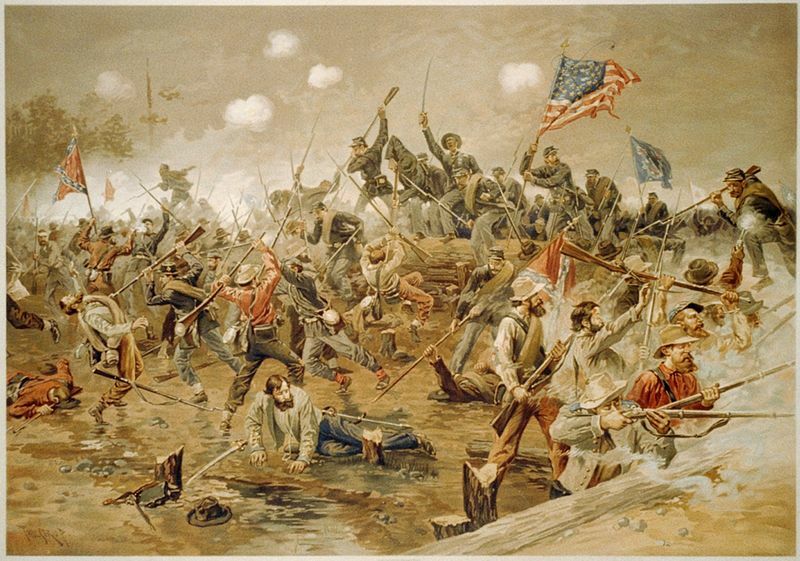 The battle was fought in the Rapidan-Rappahannock river area of central Virginia, a region where more than 100,000 men on both sides fell between 1862 and 1864. The most intense fighting took place on May 12—a 23-hour battle over a section of fortifications which was known as the Mule Shoe, and, afterwards, as the Bloody Angle of Spotsylvania. After the Battle of the Wilderness, in which Lee delayed the Union advance, Grant decided to take advantage of the position he held, which allowed him to slip his army around Lee's right flank and continue to move south toward the Confederate capital of Richmond, Virginia. He already had troops on the move by the night of May 7, just one day after the Wilderness fighting ended, and on May 8, he sent Maj. Gen. Gouverneur K. Warren and his V Corps to take Spotsylvania, 10 miles (16 km) to the southeast. However, Lee anticipated Grant's move and sent forces to intercept him: cavalry under Maj. Gen. J.E.B. Stuart and the First Corps, commanded by Maj. Gen. Richard H. Anderson (its usual leader, Lt. Gen. James Longstreet, had been wounded in the Wilderness). The Confederates won the race to Spotsylvania, and on May 9, each army began to take up new positions north of the small town. As Union forces probed Confederate skirmish lines on May 9 to determine the placement of defending forces, Union VI Corps commander Maj. Gen. John Sedgwick was killed by a sharpshooter; he was succeeded by Maj. Gen. Horatio G. Wright. Lee's men dug in to a trench line stretching more than four miles (6.5 km), surrounding the Spotsylvania Courthouse and critical crossroads. The earthworks were reinforced with timber and guarded by artillery placed to allow enfilade fire on any attacking force. There was only one major weakness in Lee's line—an exposed salient known as the "Mule Shoe" extending more than a mile (1.6 km) in front of the main trench line to defend a section of higher ground. Lee recognized this weakness during the fighting of May 10, when twelve Union regiments under the command of Col. Emory Upton followed up a concentrated, intense artillery attack by slamming into the toe of the Mule Shoe along a narrow front. They actually broke the Confederate line, and the Second Corps had a hard time driving them out. Upton's attack won him a promotion on the spot to brigadier general, and it became a staple of military textbooks on how to break an enemy trench line. Other Federal assaults on May 10 were less successful, and the day was generally characterized by uncoordinated frontal assaults that Grant ordered impulsively. Repeated attacks were particularly futile along the Confederate left, where Union General Warren failed many times to storm a position called Laurel Hill. On May 11, Grant began the planning for a new major assault aimed at the Mule Shoe salient, with the intent of employing Upton's tactics on the level of an entire corps. Lee took Grant's inactivity as a sign that the Federal Army was getting ready to pull back, either for a retreat, or for another sidle to the East. As a result, he weakened the critical sector of the Mule Shoe by withdrawing its artillery support to prepare the guns for a quick countermove. Grant's pre-dawn assault on the Mule Shoe on May 12 was initially a complete success. Starting at 4:30 that morning, the well-fought II Corps of 20,000 men, commanded by Maj. Gen. Winfield S. Hancock, led the attack against the Mule Shoe in the same manner that Upton had attacked on May 10. This time, the breach in the Confederate line was complete, thanks in part to the absence of Confederate artillery support, but also because many of the Confederates suffered from wet powder in their rifled muskets due to rainfall the night before, and thus found that their guns would not fire. Hancock's II Corps took close to 4,000 prisoners, destroying Edward "Allegheny" Johnson's division of the Confederate Second Corps. The divisional commander and one of his brigadier generals, George H. Steuart, were captured. Both sides believed that if Grant succeeded in punching completely through the Confederate lines, he would be able to inflict a devastating defeat on Lee's forces. Because of the severity of the crisis, Lee felt compelled to personally lead soldiers in the counterattack. His men realized the danger this would pose to him, however, and refused to advance until Lee removed himself to a safer position in the rear. The several "Lee to the rear" episodes later became famous, and were an intense example of the personal bond that Lee's soldiers felt for him. General Gordon led the Confederate counter-attack, which succeeded in recapturing much of the eastern portion of the Mule Shoe by six that morning. The stage was set for a lengthy and bitter contest—often described as the most savage sustained combat in the entire Civil War—raging over the approximately one square mile of territory contained by the Mule Shoe fortifications. The western side of the fortifications became the center of the firestorm, which would continue for another twenty hours, much of it in the rain. Crucially, Grant had not properly prepared a second wave to take advantage of his initial success. Anxious to sustain momentum, Grant ordered supporting attacks from Wright's VI Corps, and from the IX Corps of (Maj. Gen. Ambrose E. Burnside), but the attacks were not well coordinated, and failed to recapture the momentum of the attack. Lee was also able to shift thousands of his men to seal the breach, most notably launching a counterattack with Brig. Gen. John Brown Gordon's division, and also securing much help from the able leadership of Brig. Gen. Stephen D. Ramseur. After their initial early-morning rally, the Confederates gradually won back much of the ground they had lost, and then fought desperately to retain it as General Lee ordered the ruined remnants of his Second Corps to begin construction of a new line of fortifications behind them. Grant had his VI Corps, led by Edwards, Bidwell, and Wheaton, reinforce the II Corps in their attack on the western section of the fortifications, where natural ditches in the surrounding terrain provided some cover for lines of attackers to approach the battle. In the early afternoon, both Grant and Lee attempted to shift the momentum of the battle by mounting a new attack east of the Mule Shoe. By coincidence, they both chose the same time and place for their assault: an area known as Seth's Salient just north of the courthouse, where Burnside's troops faced Early's. The resulting fight was bloody and inconclusive, and the pitched battle over the Mule Shoe continued. The fight over the Mule Shoe was characterized by an intensity of firepower never previously seen in Civil War battles, as the entire landscape was flattened, all the foliage destroyed. There was a frenzy to the carnage on both sides. Fighting back and forth over the same corpse-strewn trenches for hours on end, using single shot muskets, the contending troops were periodically reduced to hand-to-hand combat somewhat reminiscent of battles fought during ancient times. Surviving participants attempted to describe in letters, diaries and memoirs the hellish intensity of that day, many noting that it was beyond words. Or, as one put it: "Nothing can describe the confusion, the savage, blood-curdling yells, the murderous faces, the awful curses, and the grisly horror of the melee". Many described the field of battle as a morass of corpses, piled up so high that wounded men were trapped underneath them and pressed down into the mud, where they drowned. The bend in the Mule Shoe became known as the "Bloody Angle of Spotsylvania". By 3 a.m. on May 13, Lee's troops had succeeded in their desperate effort to construct a fallback line of entrenchment, which cut off the entire Mule Shoe salient. Lee had his battered men quietly retire behind it. More than 10,000 men had fallen in the Mule Shoe, which now passed to the somewhat mystified Union forces without further fighting. As May 13 dawned, the fighting had stopped, and Grant was engaged in efforts to ascertain exactly where Lee's forces had gone. They had not gone far, but they were now behind a new set of earthworks which, lacking the vulnerable angle of the Mule Shoe, were stronger than before. On May 18, Grant sent two of his corps to attack the new line, but they were met with a bloody repulse. That convinced Grant, who had vowed to "fight it out on this line if it takes all summer," that Lee's men could not be dislodged from their Spotsylvania line. Of the 3,464 Medals of Honor awarded to date, 1522 were awarded during the American Civil War. Forty-three were received during the Battle of Spotsylvania Courthouse and recipients include Frederick Alber, David Arthur, George W. Harris, and Charles H. Tracy.